Saint-Petersburg is the unique and in-imitative city. Palaces, museums, theaters, parks and beautiful suburbs made St. Petersburg a renowned piece of the world cultural heritage. St. Petersburg is a beautiful and fascinating holiday destination and one of the most intriguing and historically significant cities in Europe.The city is divided into numerous islands by rivers and canals and is often called "Northern Venice", "Northern Palmira" and "City of White Nights". A tour of the canals by boat is a great way to see the city in the summer. You will take a unique chance to enjoy the countless numbers of rivers and channels of the city, including the most famous of them - Neva, Fontanka and Moika Rivers. 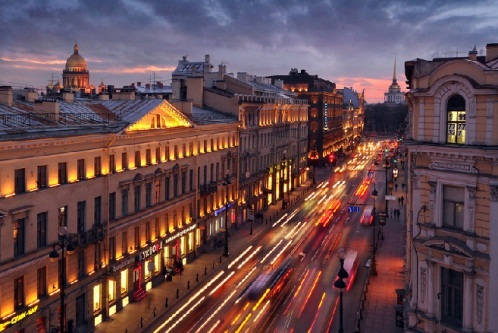 Nevsky Prospect is St. Petersburg's main avenue and one of the best-known streets in Russia. In St. Peters­burg's early years, it was simply the beginning of the road leading to the ancient city of Novgorod. But it quickly grew to be adorned with beautiful buildings, squares, and bridges, and became the very center of the bustling, rapidly growing city. The name of the road was kept after a proclaimed Saint of the Russian Orthodox Church,‘Alexander Nevsky’ (1220-1263), Prince of Novgorod, Kiev and Vladimir. He was commonly regarded as the key figure of medieval legendary status on account of his military victories over the German and Swedish invaders. The Russian State Pushkin Academy Drama Theater - the legendary Alexandrinsky Theater - is the oldest Russian national theater. It was founded on August 30, 1756 by Empress Elizabeth. 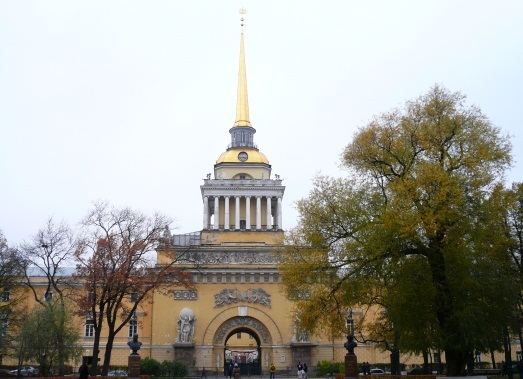 The building, designed by Carlo Rossi, is one of the outstanding examples of Russian Classicism. The theater is the progenitor of all Russian theaters and the date of its founding is the birthday of Russian professional theater, promoting the Russian state policy in the field of theater arts. 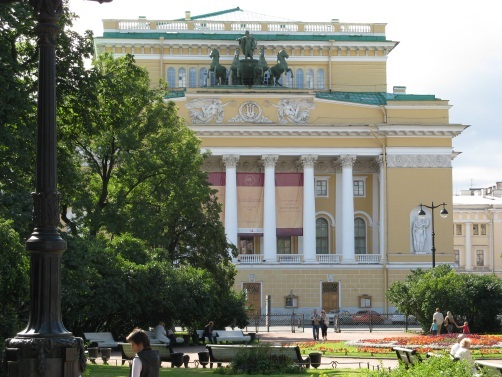 The theatre and the square were named after Empress Consort Alexandra Feodorovna. The building is part of the UNESCO heritage site. The New Stage was opened in 2013. The unique high-tech multifunctional complex was designed by a Saint Petersburg architect Yury Zemtsov. 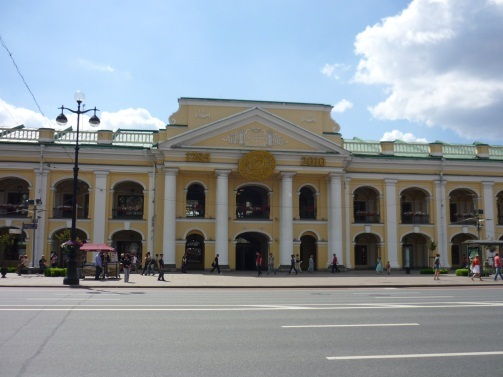 Gostiny Dvor is an old Russian term for an indoor shopping center. Dating back to the 18th Century, the Gostiny Dvor was one of the first shopping arcades anywhere in the world - a grand building of over 100 shops embracing the area of 53,000 m2, which took 28 years to complete after commencing in AD 1757. Neoclassical design. The Kazan Cathedral, named after the "miracle-working-icon of Our Lady of Kazan (holy icon of highest stature within the Russian orthodox church, the protector and patroness of the city of Kazan ), was built in the early 1800s by Alexander Voronikhin on an enormous scale and boasts an impressive stone colonnade, encircling a small garden and central fountain. Following the Russian victory over Napoleon in the Patriotic War of 1812, the cathedral became a kind of monument to Russian military glory. In 1813, the head of the Russian troops from the war of 1812, M. Kutuzov, was buried in the cathedral. 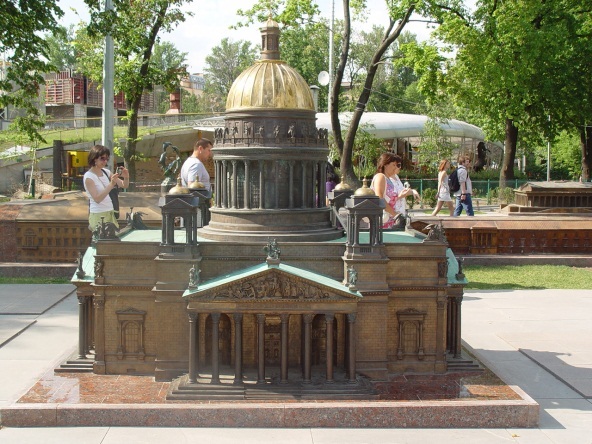 And in 1837, monuments to M. Kutuzov and M. Barklayu de Tolly were erected in front of the cathedral. 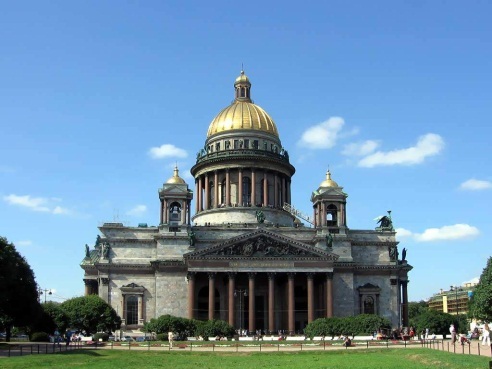 St. Isaac's Cathedral is the largest Russian Orthodox cathedral in the city and it is dedicated to Saint Isaac of Dalmatia, a patron saint of Peter the Great, who was born on the feast day of Saint Isaac. The cathedral was built over 40 years between 1818 and 1858 by the French-born architect Auguste Montferrand. The dome of St. Isaac's Cathedral dominates the skyline of St. Petersburg and its gilded cupola can be seen glistening from all over the city. The cathedral's main dome rises 101.5m and is plated with pure gold. 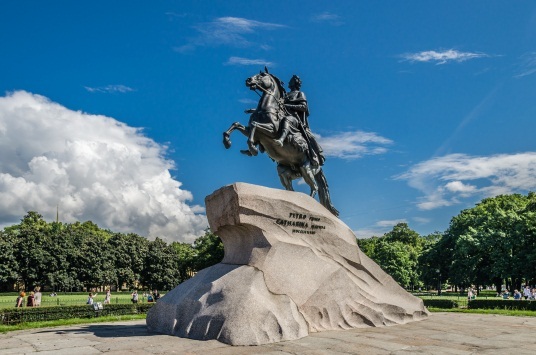 The Bronze Horseman, created by the famous French sculptor Falconet between 1716-1791, is an equestrian statue of the founder of St. Petersburg, Peter the Great, commissioned by Catherine the Great as a tribute to her famous predecessor on the Russian throne. It is also the name of a narrative poem written by Alexander Pushkin about the statue in 1833, widely considered to be one of the most significant works of Russian literature. 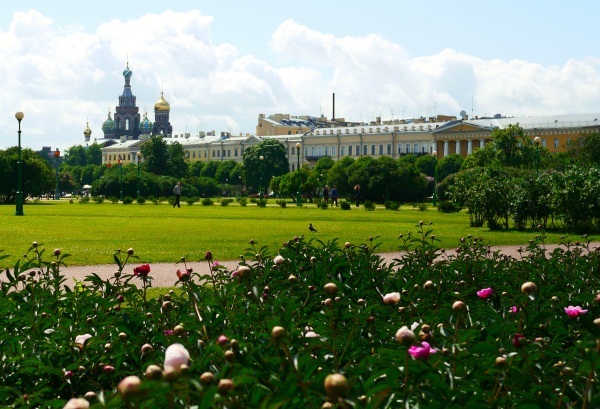 The original Admiralty was one of the first structures to be built in St Petersburg. 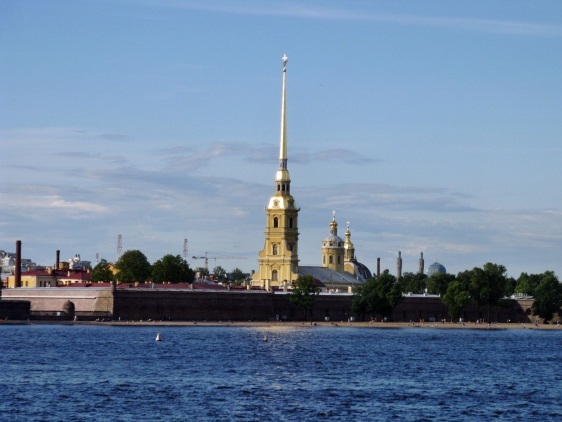 It was built as a fortified shipyard in 1704 by Peter the Great. At the beginning of the 19th Century, fortification buildings and shipyards were destroyed and then re-built in 1806-1823 by architect A. Zakharov. Its long, gilded 72-meter spire adorned with a ship is recognized as a symbol of the city. Palace Square is, from one side, bound by the facade of the green, white, and gold Winter Palace (now Hermitage) with its rococo profusion of columns, windows, and recesses - and from the other side by a semi-circle classical building of the General Headquarters, decorated by the Triumphal Arch topped by the Chariot of Victory - a monument to the Napoleonic War. The Alexander Column in the center commemorates the victory over Napoleon. The column is named for Emperor Alexander-I of Russia, who reigned from 1801-1825. 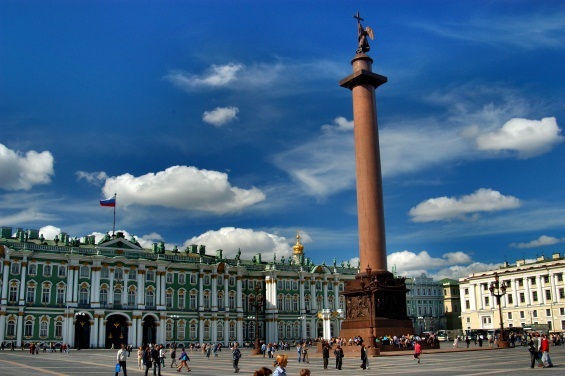 The State Hermitage is a museum of art and culture in St. Petersburg. 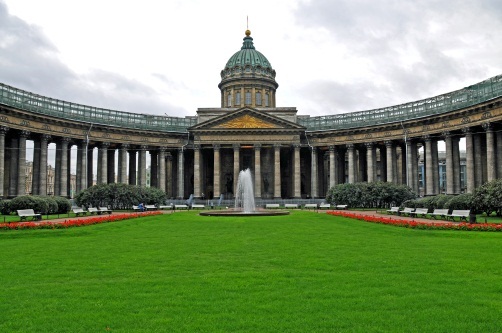 As one of the largest and oldest museums in the world, it was founded in 1764 by Catherine the Great and has been open to the public since 1852. Its collections, of which only a small part is on permanent display, comprise over 3 million items from all over the world and from throughout history (from Ancient Egypt to the early 20th century Europe), including the largest collection of paintings in the world. The main architectural ensemble of the Hermitage consists of the Winter Palace, the former state residence of the Russian emperors. Architect Bartolomeo Rastrelli. There is an Indian section also in the Hermitage. St. Michael's Castle, also called the Mikhailovsky Castle or the Engineers' Castle, was built as a residence for Emperor Paul I (son of Catherine the Great) by architects Brenna and Bazhenov in 1797-1801. The castle looks different from each side, as the architects used motifs of various architectural styles such as French Classicism, Italian Renaissance, and Gothic. Paul only spent 40 days in the St. Michael's Castle - on the night of March 11/12, 1801, he was murdered in his bedroom in a palace coup. Its official name is ‘Cathedral of the Resurrection of Christ’. 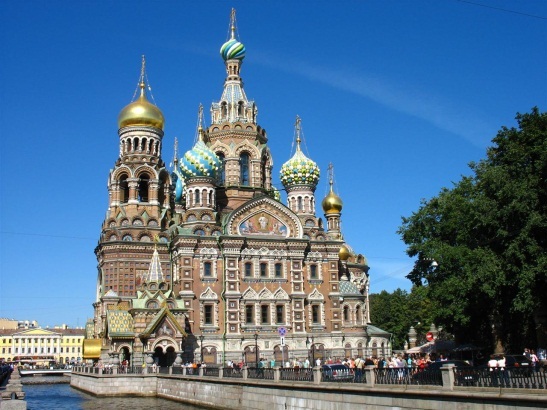 This marvelous Russian-style church (with (medieval-Romantic nationalism style- 13 onion shaped domes) was built on the spot where Emperor Alexander-II was assassinated after bomb explosion in March 1881 and was dedicated in his memory. Both the interior and exterior of the church are decorated with incredibly detailed mosaics, designed and created by the most prominent Russian artists. The church contains over 7,500 square meters of mosaics. The church was built during 1883 to 1901. Architect was Alfred Alexandrovich Parland. 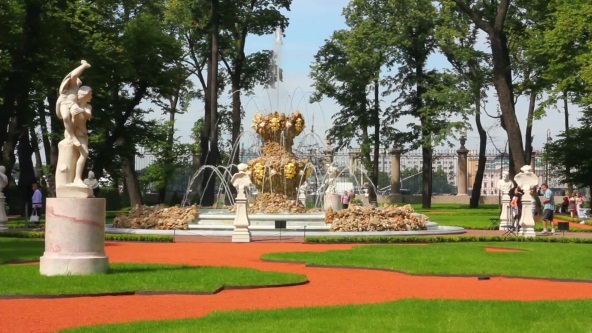 The Field of Mars is a Large park named after Mars - the Roman god of war - situated in the center of St. Petersburg, with an area of about 9 hectares. On November 6, 1957, an eternal flame was lit in the center of the field, the first eternal flame in Russia. 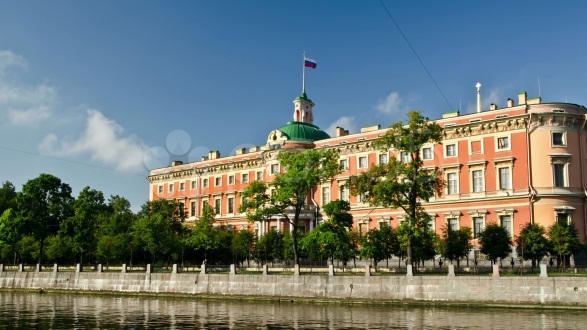 The MarbLe Palace building was commissioned by Empress Catherine the Great for her favorite Count, Grigory Orlov. One of the first Neoclassical palaces in St. Petersburg, it was designed and built between 1768 and 1785 by the Italian-born architect Antonio Rinaldi. Thirty-two different types of marble were used to decorate the building's facades and interiors, hence its name. The Marble Palace, a branch of the Russian Museum, houses an excellent collection of modern and pop art. The palace is also used to host a wide variety of temporary exhibitions. The collection "Mini-City" contains small bronze models of the main sights of St. Petersburg, including miniatures of Palace Square and Senatskaya Square, Peter and Paul Fortress, Kazan Cathedral, and St. Isaac's Cathedral, as well as bronze statues of architects Rastrelli, Rossi, Trezzini, Montferrand, Tomas de Tomon, and also the figure of St. Peter, the patron saint of St. Petersburg. The Peter and Paul Fortress was founded by Peter the Great in 1703 and built to Domenico Trezzini's designs from 1706-1740. Peter and Paul both were patrons of the Peter the Great. The birthplace of the city never served its intended defensive function. Instead, it has had a rich, hugely varied, and sometimes sinister history as a military base, a home of government departments, the burial ground of the Russian Imperial Family, the site of ground-breaking scientific experiments, and a forbidding jail that held some of Russia's most prominent political prisoners. The town is located 25 Km from St. Petersburg. Renamed in Soviet times to honour Russia's greatest poet Alexander Pushkin. Catherine Palace is undoubtedly Tsarskoe Selo (Pushkin)’s top attraction, particularly renowned for the extraordinary Amber Room. Bartolomeo Rastrelli was the architect. 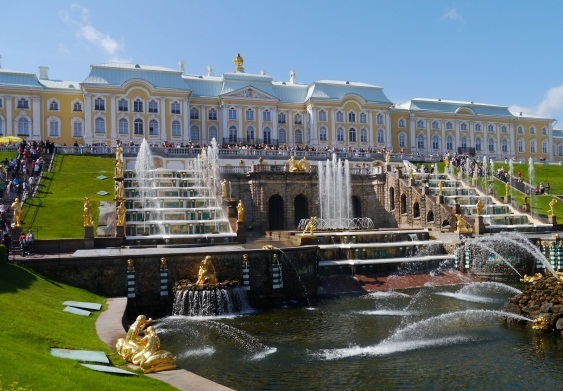 It was the summer residence of the Russian tsars. Empress Elizabeth constructed the new palace from 1752-1756 in a flamboyant Rococo style. More than 100kg of gold were used to gild the sophisticated stucco façade and numerous statues erected on the roof.